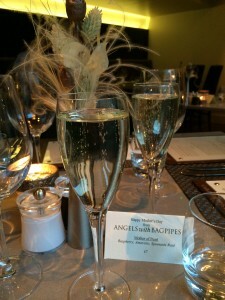 I have nagged my family over a few years now, to have dinner at Angels with Bagpipes. It is always reviewed well and the menu looks tantalizing and exciting. For Mother’s Day I finally managed to persuade them. Arriving at 5.45 pm for a Sunday night early dinner, we were offered both the lunch menu and a la carte. As a group we picked a mix of the two. While AwB does not have a separate gluten free menu, it is not actually necessary, as so much of the options are actually gluten free, or easily adapted. The staff were knowledgeable and discreet – though I still had the teenage son cringe factor to deal with – though definitely minor compared to other times. As half our party was early, we sneaked a lovely glass of prosecco while waiting – good value at £7 a glass and very light and zingy, as one might expect. For Mother’s Day there was a cocktail on offer, but as a reluctant cocktail drinker, I was very happy with the fizz. Ordering was easy and straightforward after the long chat I had received from a manageress with her full knowledge of the menu. 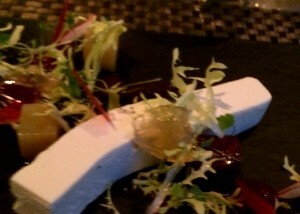 I chose goats cheese with beetroot, verjus, hazelnut and yoghurt. A really good choice – light and tasty and very attractive on a slate board. While the others enjoyed a good pile of bread with oil and vinegar, I was breadless. While, actually, I was always breadless before being diagnosed as am not really a bread eater and so do not miss it, I am beginning to realise that it is not that difficult to bring out a small piece of gluten free bread for those that do want it. Having tried a few of the better quality rolls now: M&S olive ciabatta (amazing! ); Newburn Bakehouse seeded rolls (nice) and Genius seeded rolls (v good); I believe a good restaurant should have one of these in the freezer ready to produce for the rare coeliac visitor. When I produced a poached egg on ciabatta for my breakfast only this morning, I whizzed the ciabatta for 2 minutes on defrost in the microwave, then warmed it gently in the oven for 3 minutes. So come on quality restaurants – get your act together as it is very easy! I am still reeling with the referred shame of the two slices of nasty white bread served up at an event at Prestonfield House! Anyway, back to Angels with their wonderful Bagpipes …My main course was superb: Lamb with kale, spiced lentils, aubergine and shallot. All GF of course, and all excellent. The aubergine brought a lovely smoothness to the lentils and the little round of lamb belly was simply melt-in the-mouth tasty. Others of the family enjoyed a superb steak (though the frites were not gluten free, sadly); pork belly with a scattering of something glutenny on the top, but with delicious veg and Shetland Black potatoes ( I once grew these – they are wonderful and purple! ); and a very good gluten-loaded pasta. The food at Angels with Bagpipes is of the best. I had two tiny gripes: the bread as mentioned above and the rather ordinary paper towels in the loo. Other than that, I love love love this place and want to go back forever. Its intimacy and warmth of both surroundings and staff, make it very special. And the clarity of menu and lovely wine by the glass, bring it to the top of my list of Edinburgh restaurants. And it was jam packed on a Sunday evening, which is a very good sign of the recognition it is rightly receiving. As always, apologies to those who do not eat at restaurants of this calibre, as I know the better places like this take gluten free dining as a matter of course. While there, we did speculate whether somewhere like Nandos is similarly clued up, but I am not sure I am the reviewer who is going to tell you that!